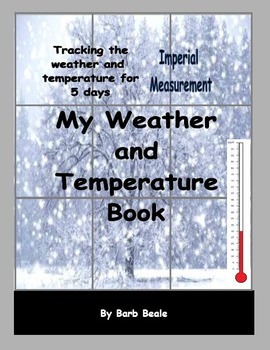 My Weather and Temperature Book is perfect for a week of looking at predictions of temperature and weather using an imperial thermometer in degrees Fahrenheit. 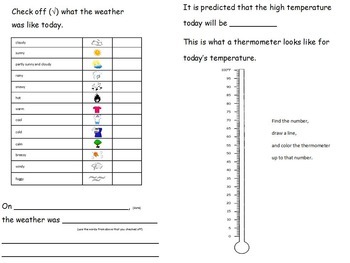 Tie in media by looking at the weather forecast in newspapers, on the internet, weather channel or iphone. Examine how accurate the forecasts are. Updated April 2015. 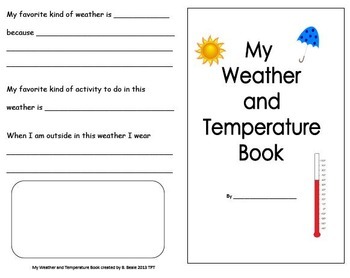 Children record the date, use a checklist for the weather, print the weather (spelling provided), record the temperature using a thermometer as a number line, color the thermometer and record favorite type of weather, favorite activity and clothing to wear over the 5 days.